I HAD booked my seat for the final show of the evening, wedged between the rocks under the tiny cairn of A’Mhaighdean, sheltered from the fierce wind whipping across the summits. Ahead lay what many regard our finest mountain view; the deep trench that separates this remote Munro from those of stately Beinn Lair, the Dubh Loch spilling round to the causeway then Fionn Loch taking up the baton all the way to a chaotic expanse of shining lochans picked out by the late sunshine. Solar power had turned the western vista into a land of silhouette and silver, but a turn of the head in any other direction provided a different picture. A pastel rainbow ribbon circled the horizon highlighting some slopes bathed in a glowing copper red, others blue, individual rocks standing out with a glint from sheets of pale scree. Then, firing out a reminder as to who the real star of this show was, a blinding show of energy from the dipping sun, the Dubh Loch now a pulsing gold nugget amidst the darkness of its surroundings. It lasted seconds, a last hurrah, before the start of its graceful descent. The red, yellow and purple horizontal line mostly held at first, the only breach bang in the centre where the ball of light was melting its way through the surface. The fierce yellows that had conquered every expanse of water now inhaled powerfully and speedily back to source. A strange lull followed for a few seconds, before someone lit a fire below the horizon and the world became backlit again. The crescent moon now started its shift in earnest, hanging in the evening blue, high above the late colours left by its dayshift partner. It was time to head down. The light was fading fast; slopes and bumps were losing their contours, all definitions merging into one, fields of late-lying snow glowing in the moonlight. I didn’t have far to go though. My refuge for the night was the rough stone howff which sits in the col between A’Mhaighdean and Ruadh Stac Mor. A giant, sloping rock has become wedged at an angle, creating a dry shelter with a small entrance which has been given extra manmade protection from the elements. It’s small, a shelter for two men and a dog which was lucky, because when I got there I found another wanderer, Michael, and his collie Missy already tucked up for the night. I managed to squeeze in beside them on the earth floor, a welcome reprieve from the wind. The night was spent largely sleepless - that tends to happen when you have a rock for a pillow - but vicious gusts cracking against the walls confirmed I was wise to go underground rather than try to pitch a tent and then wake up somewhere far away, Wizard of Oz-style. It never truly got dark - I had a constant view of the stars through my rock skylight on a background somewhere between black and blue and the sickle-shaped moon shining above the snow streaks of A’Mhaighdean. I rose at 4am, my eyes already accustomed to the low light. I had a long way to go. The route on to the second half of the Fisherfield circuit means a slight reclimb of A’Mhaighdean to find the best route to Beinn Tarsuinn. The sun which had disappeared only six hours ago was already reawakening as I headed through the jumbled pale outcrops and deep snow in the folds and creases of the ground. This next section always feel the longest and toughest of the traverse, a deep division that involves a drop in height to 525 metres accompanied by a tiresome game of dodge the worst of the bog. This is the bete noir for those tackling the round, the moment of truth that will prove if weary legs are up to the challenge. Any expedition into these mountains is about water. There are several rivers that can prove dangerous to cross after heavy rainfall and the most likely result in these conditions is retreat. Long, hot spells negate the river problem but provide plenty of their own. Convenient running water sources are in short supply higher up and that means a lot more needs to be carried, adding weight to your bag and footfall. These hills should be enjoyed over a couple of days, wild camping along the way. With the mercury hitting 28C in this part of Scotland I wanted to carry as little as possible. I had a lightweight tent in case of emergency, but my intention was to stay in the howff between dusk and dawn. I wanted to end the first day with a sunset and start the next with a sunrise. I set off from Corrie Hallie around 2pm. The heat immediately felt oppressive but there was a strong wind. I met a few souls coming out, the day strollers talkative, the ones coming to the end of a multi-day trip less so, all concentration focussed on those final weary steps. The first hazard, the notorious Abhainn Strath na Sealga, was inconsequential, its waters running low. The recent dry spell also meant that the usual squelch across the next kilometre or so to the next crossing at Larachantivore was a few levels down in sogginess, and a boulder was enough to cross the river running down Gleann na Muice. I followed the river then swung west into Gleann na Muice Beag, a superbly engineered path skirting round Beinn Dearg Mor and into the lonely confines above Loch Beinn Dearg. There were deer feeding here and off to my left the run of a small waterfall was being converted into a hanging, whirling ball of fine mist by the wind. 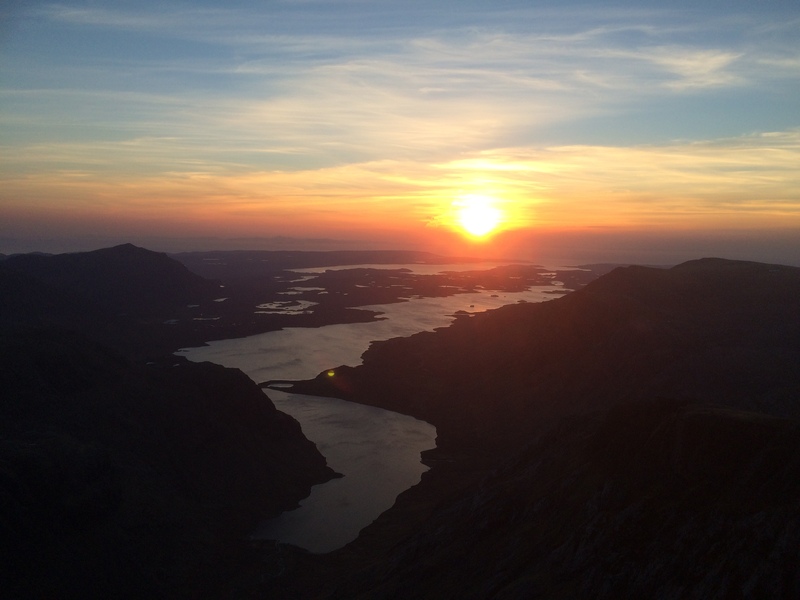 The route levels out alongside a series of lochs with Ruadh Stac Mor and then A’ Mhaighdean thrusting into the spotlight. For a while you seem to be going away from these mountains but then the path splits and turns up by Fuar Loch Mor, disintegrating more and more underfoot the higher you rise. A small cairn marks the start of the difficult to spot passage through the crags and I was at the summit in 20 minutes. I descended quickly and located the howff - I didn‘t want to be searching for a needle in a rocky haystack in the dark - then made my way up to A’Mhaighdean for the light show, with Ruadh Stac Mor burning red behind. Some seven hours later and I was heading down the same ridge to continue the round. 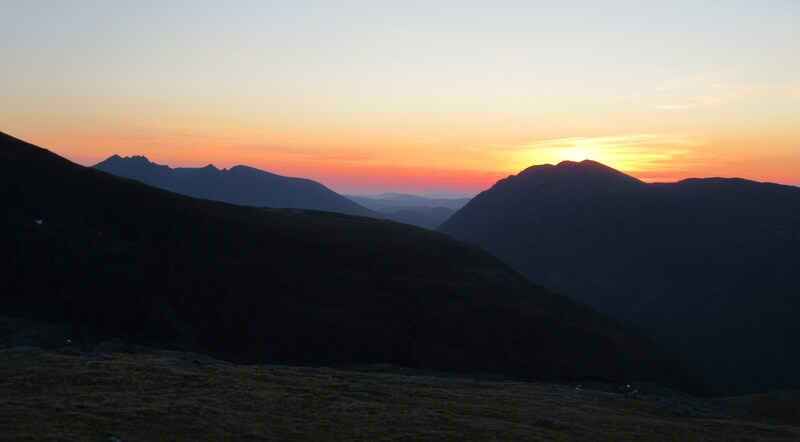 The sky to the east was starting to catch fire, picking out every one of An Teallach’s spires in the burgeoning, multi-coloured glow, a prelude to the new day. Fears about the state of the ground leading to Beinn Tarsuinn proved unfounded but the summit looked a long way off. The only thing to do was get the head down and plod. 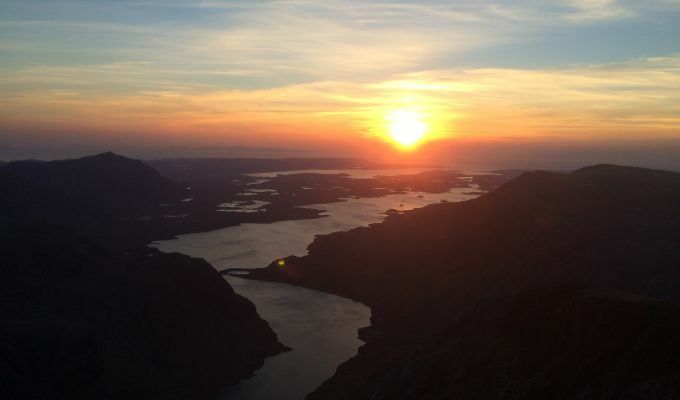 I caught the ridge early, and enjoyed the best side of Beinn Tarsuinn, a series of towers more suited to a Torridon mountain providing a bit of early sport, and then a stroll over that curious flat, sloping rooftop often referred to as Table Mountain, before the final push to the top. Slioch and Beinn Lair were busy strutting their stuff in full light, while it was A’Mhaighdean’s turn to glow red. Way off to the east and south, the glens were filled with white cloud turning the blue shapes of the hills to distant islands among roiling seas. Long shadows occupied Gleann na Muice, the hills appearing as pieces from a jigsaw, ragged blackness cutting through their familiar lines, as I toiled up the boulder slopes of Mullach Coire Mhic Fhearchair in the curious conditions - baking heat one minute, an icy wind trying to knock me off my feet the next. By the time I was ascending the fifth Munro, Sgurr Ban, I was dressed more for a winter’s day again. It only took ten minutes of descent into the white boulder chaos to make up my mind that I wouldn’t be climbing the final peak - sorry, Beinn na Chleidheimh, nothing personal - as there was a long way still to go and the famed Fisherfield weariness had set in. It’s a long haul from here to the river, first that shattered white rock, then a series of long boiler plate slabs and finally tough heather and grass. A last glance down Strath na Sealga, snaking waters cutting gently through stands of yellow gorse and naked trees, Beinn Dearg Mor hogging the attention. Over my shoulder, Sgurr Ban looked a distant memory already. I had captured these peaks through every minute and every mood of the day, a true mountain cycle.